P. J. Proby, the controversial pop singer who was banned from appearing at either ABC or Rank cinemas two months ago, is to appear at the independently owned California Ballroom, Dunstable on April 17. Miss Edwina Green, for the ballroom's management said it was understood that Proby had "cleaned" up his act. He was ordered off the stage at the Luton Ritz Cinema in January. 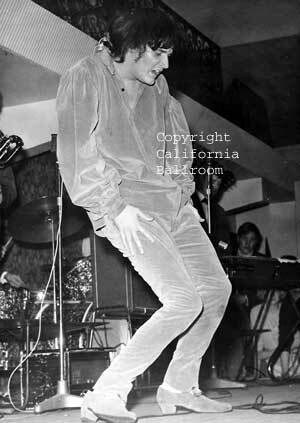 Well, P. J. Proby has been to Dunstable and now I know what a sardine feels like. The reception he got from his fans was tremendous. I haven't been able to hear properly since Saturday night. The supporting groups were good, and the hall was packed with dancing couples. But it was obvious that everyone was waiting for Proby. Long before he arrived, a crowd was building up around the stage. When he did come, the dancing stopped altogether. First came his orchestra, which played three or four numbers, while the tension rose. Then came a vivid blue blur - Proby, dressed in a turquoise shirt, with tights and shoes in the same colour. His appearance heralded a new high in the manipulation of the human voice - from the screaming girls I mean. Some of the notes they hit I didn't think existed. Proby went into his performance, and he is a real showman. It didn't seem to matter much what he sang, the girls were with him all the way. 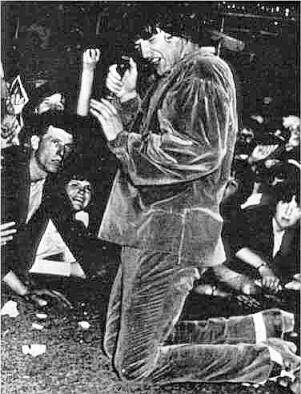 And I'm sure he would have been with them if they had had their way, but the crash barriers saved him from being hauled off the stage. The barriers were the idea of Mrs. Green. Equipment from the wrestling ring was used, and it effectively forestalled any ideas of invading the stage. Early in the act, I beat a strategic retreat. I couldn't see much where I was, and I'd lost half a stone in perspiration. Moving back to the wall, I found a foothold on a girl's shoulder - she was too busy screaming and didn't notice - and rested the other foot on the back of a chair. This was a bit better, but the trouble was that everyone else was doing the same. There was no dancing at all now. All eyes were on the stage. The noise was terrific. On stage, Proby and his orchestra were doing their bit and doing very well, if you like Proby. Even if you don't, you can't deny his showmanship. Off stage the girls were really putting their hearts into it. Their screams rose periodically to a deafening crescendo. How they combine this with chewing gum will remain one of life's great mysteries. I moved further back to where the audience was slightly sparser. Then I felt a tap on my arm. " 'Ere mate, lend a shoulder." Three stalwart youths were leaning back, supporting the weight of a dozen or so girls who were standing on a table and leaning forward to scream. At least, they had their mouths open, but any sounds they made were well beyond the hearing range of my shattered eardrums. I took a last drag on my cigarette and put my shoulders to work. And that's when the whole lot fell down. I shall have to give up smoking, I think. Meanwhile Proby was belting out his numbers with the fervour of a revivalist preacher - a fervour matched and surpassed by his audience. With his long hair about his face, and an exhausted, agonised expression he really puts a lot into his act - Proby had the look of a Biblical prophet. In spite of his costume. This impression was heightened by the reaching of hands to touch him ... some mystic healing power? 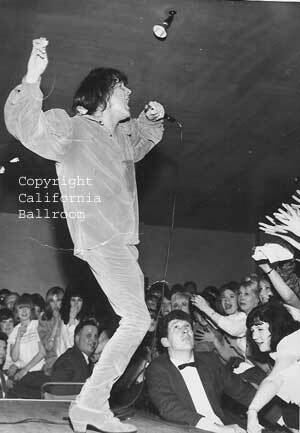 ... and by Proby's mopping face - a master stroke this - and throwing the handkerchief into the crowd. Proby has disciples rather than fans, I think. But those of us who could watch his act a little more dispassionately - and you have to be male it seems - could not help but admire the way he put it all over. He has a quiet voice, apart form personality, and he uses its full range. I certainly enjoyed his performance - except for "I Apologise" which I think is awful - and his orchestra was first class. This was a great stage show - just back from Copenhagen we were told, which could explain Proby's air of exhaustion - and it packed the California. It is pleasant to record that the evening passed without incident or damage. The only casualty as far as I know, was myself. I incautiously rested my hand on a table for a second and some graceful, sylph-like maiden put her great foot on it. As for the controversy about Proby's "obscenity" his performance on Saturday was as pure as the driven snow. We might even have to start calling him "P. J. Probity" Mrs. Green tells me that there is a distinct possibility that he will be returning to the California. There is no doubt about the welcome he will receive when he does. 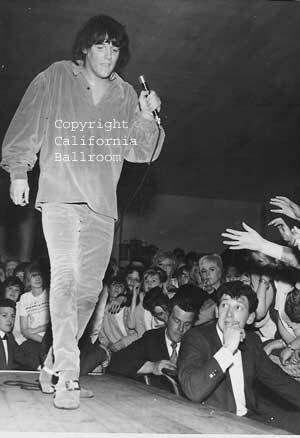 Footnote: "I worked at the Cali from 1962 to 1966, that's me with P J Proby.